Junk food can be found everywhere your child turns. It’s at her friend’s birthday party, her school celebrations and sporting events. Even her grandmother has a designated cupboard specifically designed to satisfy your child’s sweet tooth. We can’t always control what happens outside our home, but we can control what happens inside our home. So why not create a place where healthy eating is the norm? If you create a healthy environment at home, then your kids won’t know any differently. They won’t feel restricted. In addition, keeping sweets out of the home eliminates any arguments about food — particularly in weak moments. When sweets are stocked at home, it sends mixed messages about your desire to eat healthy. Kids will wonder if it’s unhealthy, why do we have it here to eat? 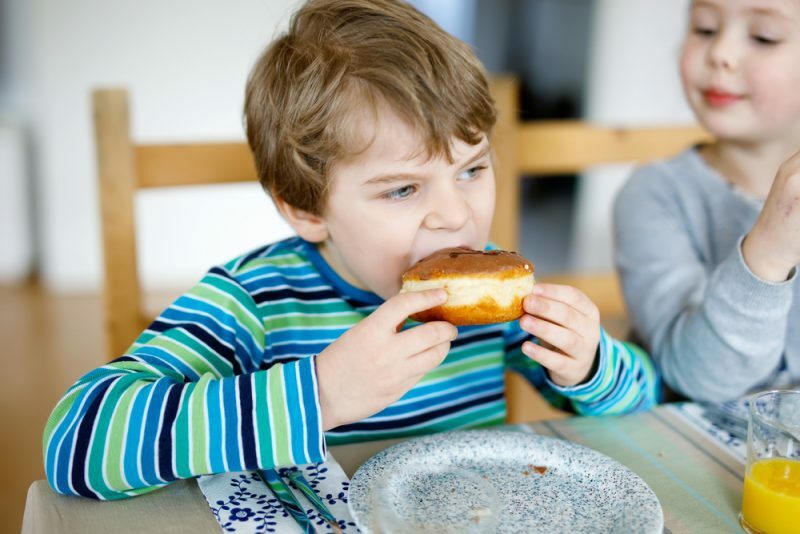 Sweets and other unhealthy foods can alter and even damage kids’ taste buds. Over time, they will begin to reject fruits and vegetables because they’re so used to the taste of hyper-sugared foods. She offers 5 tips to protect your home from sweets and help your kids make healthier choices — even outside your home. Start small. If you’re guilty of stocking your pantry with junk food, start off by getting rid of the high-sugared foods first, such as doughnuts, pudding, fruit snacks, sugared cereals and sweet drinks. From there, you can gradually make the switch to healthier options. Focus on what you can control. You can teach your kids about the negative consequences of eating sweets, but you can’t control what they ultimately choose to eat. So, focus on what you put in your refrigerator and pantry at home. You can stock your pantry with low-sugar granola, popcorn, and dried fruits and nuts. Stock your refrigerator with fresh fruits, low-sugar yogurt and cheese, veggie and dips. Talk to their influencers. If a friend or family member, such as a grandparent, is introducing too many sweets to your child, talk to them about your concerns. Ask them to limit the sweets and offer ideas on healthier options that you’d prefer. Just make sure you don’t have that conversation in front of your child. Teach kids to be in tune with their body. When kids choose unhealthy options, help your child connect to her own experience to make it a teachable moment. Ask her about how sweets make her body feel afterward. Does she have a headache? Does her tummy hurt? How do her clothes fit? When kids pay close attention to how sweets and other junk food make them feel, it will empower them to hopefully make better choices. Keep it positive. Instead of arguing about eating sweets, spin the conversation to a positive one. For example, you could create weekly family goals together about eating healthier. Maybe this week the focus is on drinking more water, and next week the focus is on incorporating more veggies into meals. This way, it gives kids the sense they’re doing it on their own.